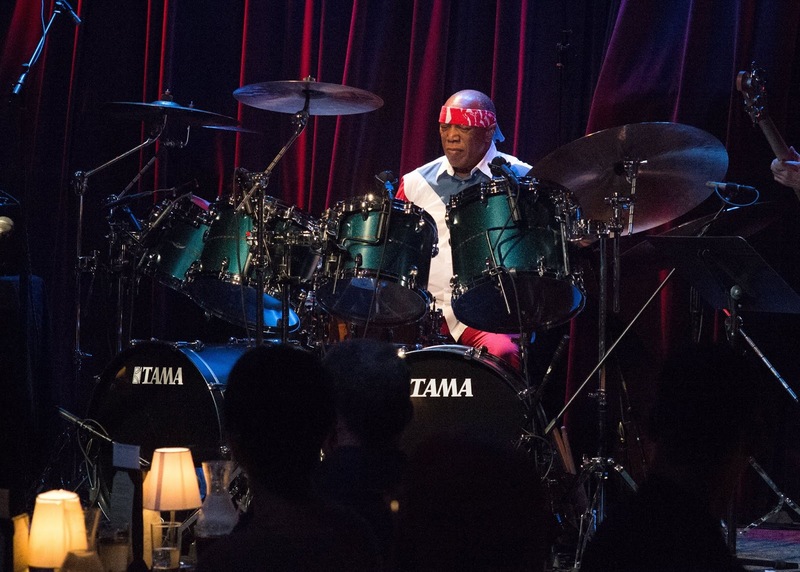 Highly influential drummer and jazz fusion pioneer Billy Cobham brought his Crosswinds Project to Dimitriou’s Jazz Alley in Seattle to begin his 2018 US tour. 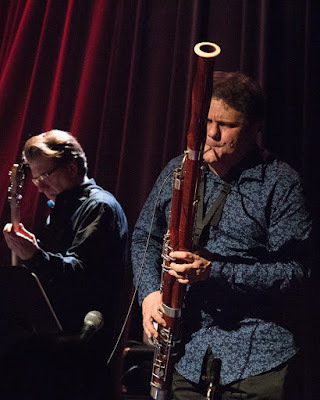 The A-list quintet featured guitarist Fareed Haque, Paul Hanson playing bassoon and soprano saxophone, Scott Tibbs playing keyboards and electric piano, and Tim Landers – a member of Cobham’s Glass Menagerie band – playing electric bass. Both sets focused primarily on material from Cobham’s 1974 era that yielded two highly acclaimed albums featuring the late guitarist John Abercrombie and saxophonist Michael Brecker, Total Eclipse and Crosswinds. They also highlighted material from his acclaimed first solo release featuring the late guitarist Tommy Bolin, 1973’s Spectrum. Cobham and his group performed two sets of equally intense yet contrasting music. Starting the evening off with the title track from Crosswinds, the band was funky, solid and articulate with a laid back vamp, Tibbs on keyboards working off of the drums. “Spanish Moss,” played during both sets, was syncopated and complex in 9/4 time. Hanson soloed on bassoon with Tibbs’ electric piano prominent, the odd time signature changing in funk fusion. Cobham was in the pocket and solid as the music built to crescendo. Tibbs and Hanson improvising freely, Cobham took a tasteful drum solo blending flams, singles and doubles, finally bringing the band back in with accents. The tune built gradually with Tibbs out front playing coordinated lines with Hanson, bringing it to an explosive end. Also from the Crosswinds album and featured during both sets was “The Pleasant Pheasant,” played in upbeat standard time with Hanson switching to soprano saxophone. Hanson played lines with Haque then took a solo over the fierce up-tempo groove. Cobham then improvised in a duet with Landers, his mesquite stave snare drum newly handmade by Jerry Garcia played with bite, sensitivity and a full tone. Cobham and Landers coordinated at the bridge, Haque extemporizing and building to a climax to end the tune suddenly. Cobham introduced “Under the Baobab Tree,” having been inspired during his travels through Africa. Also known as the “tree of life,” it provides shelter, clothing, food, water and a place where people come together as a community. Haque opened playing acoustic guitar, his finger picking articulate and melodic. 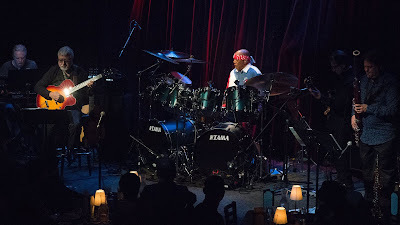 As the music transitioned from slow 3/4 to standard time, his guitar melody was complimented by Cobham playing an undercurrent of patterns on his snare and toms. Hanson soloed on bassoon, working off of Haque as the dynamics and intensity increased to an explosive break and then lowered to no time at all with Tibbs playing slow, moody electric piano. Cobham dedicated “Heather” to the late John Abercrombie, Michael Brecker and George Duke, all of whom performed on Crosswinds. Tibbs’ intro on keyboards was atmospheric and psychedelic, leading into a slow cadence with Hanson on bassoon contrasting with Haque picking loosely. 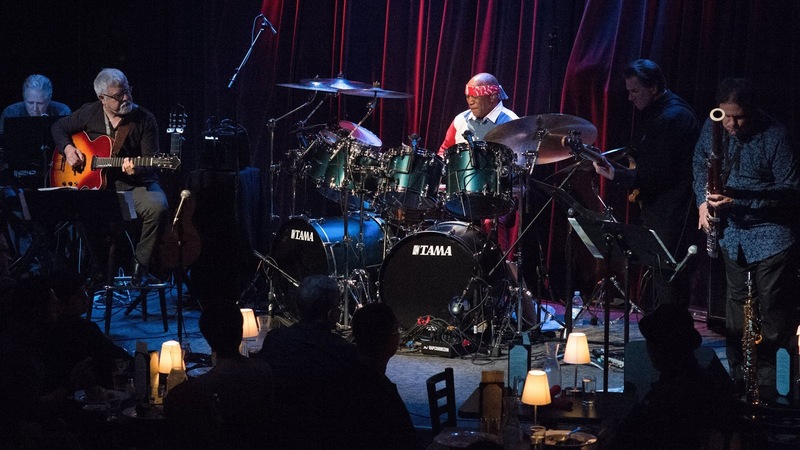 As Tibbs crescendoed on electric piano, Cobham dropped the dynamics playing a press roll on his snare, Hanson improvising fluidly on bassoon to build back up to the theme. Hanson’s playing became more transcendent with Haque soloing, bassoon and guitar joining in the melody as the rhythm faded back to cymbal wash ending the tune. “Stratus,” the raucous opening track from Side B of 1973’s Spectrum album, began with Cobham playing a melodic drum solo, his tom work telling a story. 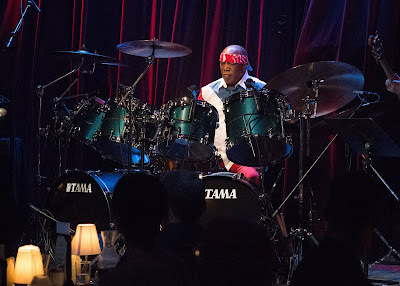 His Garcia snare tuned high, he moved to the lower toms with rudiments and flams reminiscent of Art Blakey’s approach, building speed and dropping the intensity, finally executing a press roll with tonal depth and texture. Bass and electric piano started the groove, the melody played by Tibbs, Haque and Hanson with Landers and Cobham riffing fiercely. Tibbs wailed on keyboards playing figures and patterns, improvising with velocity and feel. Cobham, in a duet with Hanson on bassoon effectuated with wah, played solid double bass leading to a break. Haque’s playing was uninhibited, transcendently working off of Cobham to take the music to the stratosphere. With the groove cresting into coordinated melodic lines, Cobham took a solo with patterns on the drums and cymbal accents, finally bringing the tune to its explosive end. One of my favorite drummers of all time. 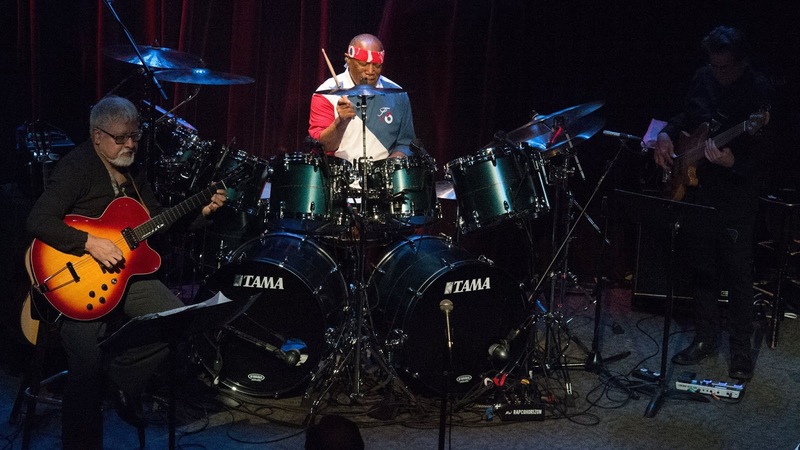 He inspired me to learn to play drums when I was already in my early 20's! I first heard him with John McLaughlin and saw him perform with him and then later saw him on his first solo tour with John Abercrombie and the Brecker Brothers in the band. All my most memorable concerts! It would be great to hear him perform some of that material live again. We saw Billy and Co perform this set in London a few months ago. He can certainly still smash it. Impressive stuff from a total legend.